Dove hunting is a long-standing tradition in North Carolina. Typically, dove hunts were a way of taking advantage of an opportunity for abundant mourning doves after farm fields were harvested. You are invited to join Kids In Nature for our Annual Youth Dove Hunt on opening day – Saturday, September 2, 2017. Pre-registration is required (space is limited), and all youth attending the hunt must possess a valid NC Hunting License or must attend a Hunter Education Field Day hosted by Kids In Nature. You can register HERE. 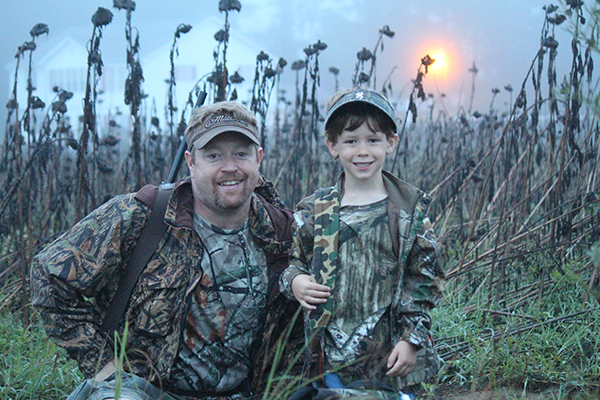 Select “Youth Dove Hunt” under Event section. After you register, we will send a confirmation email and provide the date, time, and location of the Hunter Education Field Day. Again, all youth hunters must attend the field day or must have a current hunter safety certificate. During the hunt, all youth will have one-to-one supervision and guidance from an experienced and licensed North Carolina Hunter. All birds harvested will be dressed (breasted) and prepared for you to take home for cooking. We will also provide a dove lunch with some of our favorite recipes. On the day of the hunt, we will go over boundaries and hunting rules to ensure a safe and successful Dove Hunt. If you are an adult and interested in volunteering for the Youth Dove Hunt, please fill out our volunteer form- HERE. If you have questions or would like more information please contact, Billy Bartz: billy@kidsinnaturenc.org or 919-467-1177. To learn more about Mourning Doves and hunting regulations, visit: http://www.ncwildlife.org/Learning/Species/Birds/Mourning-Dove#28391026-seasonsbr-limits.